In an elegant townhouse in historic Beacon Hill, No.9 Park provides an intimate, European-scale setting in which to enjoy James Beard Award-winning Chef Barbara Lynch's refined cuisine. The menu showcases an artful blend of regionally-inspired Italian and French dishes with an emphasis on simplicity and flavor. An extensive wine list includes a number of regional wines from boutique vintners whose style reflect a taste of place. The dining room, designed by C&J Katz, radiates timeless elegance with the muted taupe palette, dark polished wood floors and Italian marble tables in the cafe. 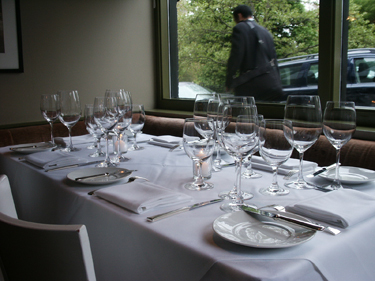 From the carefully selected wines to the warm hospitality, No.9 Park sets the standard for fine dining in Boston. In 2003, Barbara opened two more restaurants in Boston'ss South End: B&G Oysters Ltd., a classic oyster bar, and The Butcher Shop, a tribute to European boucheries that is both a shop and a cozy wine bar serving hand made charcuterie, antipasti and light dishes. The focus remains, of course, on excellence, exceptional ingredients and an extremely knowledgeable staff. Barbara Lynch and No.9 Park have been featured in local and national publications including Food & Wine, Travel & Leisure, The New York Times, Gourmet and Bon Appetit. Boston Magazine named No.9 Park Boston's Best Restaurant Overall in 2003 and recognized it for General Excellence in Boston in 2005. "Beacon Hill is better known for it's Brahmin history than it's gastronomy but No. 9 Park could change that."